Seven Interesting Facts About Digital Scoreboards | TimeMachines Inc.
Digital scorekeepers are everywhere nowadays: on television, at professional and amateur sporting events, online, and more. They are capable of keeping track of the score of your favorite game, telling time, putting on massive visual displays, showing advertisements, keeping you up to date on other games that you aren’t watching, and even more. But scoreboards were not always the large, visual spectacles they are today. Here are seven interesting facts about digital scorekeepers and timekeeping you may not have known. 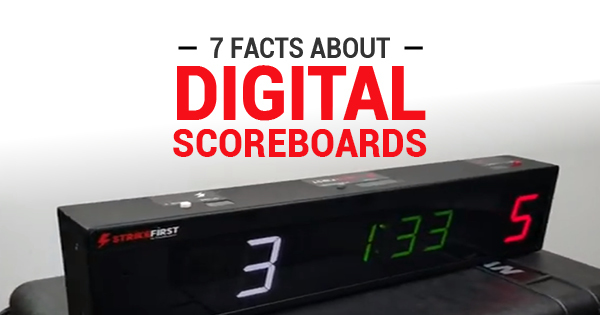 The first digital scorekeeper: The first digital scoreboard was invented back in 1908. It didn’t immediately catch on at first; team owners were worried that if people could keep score digitally, they wouldn’t buy scorecards. Do you have a second? : The smallest unit of time is known as “Planck time,” which is the time it takes for light to travel Planck’s length. Plank time is about 3.3 times 10 to the -44th power of a second. Batter up: The original digital scorekeepers were not nearly as intricate or showy as they are today. The first digital scorekeepers were built for baseball games, and only displayed the number strikes, balls, and outs. Bigger and better: The largest scoreboard in the United States is in Everbank Field in Florida. Towering at a whopping 60 feet high and 360 feet long, it is the largest electronic scoreboard in history. Adjust your watches: Many clocks on scoreboards these days are actually GPS digital clocks. These GPS clocks sync up based on satellites with built-in, highly accurate atomic clocks. Stop the presses: Back before television, scoreboards would sometimes be used as a means of watching baseball. Scoreboards outside of newspaper buildings would flash lights in simple graphics and patterns to fans that would watch the game. These scoreboards were operated based on telegraph messages that would be sent from the site of the game. It’s showtime: Newspapers weren’t the only one to use digital scoreboards in this way. Theaters would often spend excessive amounts of money on the fanciest digital scoreboards available, laying the groundwork for future televised sports. Looking for a new digital scoreboard? Contact Time Machines for all your digital scorekeeper needs, along with timeservers, network clocks, and more.